England is home to many remarkable trees. 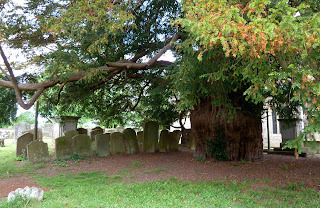 In Much Marcle we visited an elderly yew that stands in the churchyard of St Bartholomew's. The span of its branches is as wide as the church. Rows of tombstones stand at tipsy angles, sheltered by its Ent-like presence. We took turns sitting on the worn bench inside its partly hollowed-out trunk. Surrounded by the tree and its long-buried neighbors, all was silent except for the rustle of leaves and the creak of branches. What a place to contemplate the meaning of "old."